This charming traditionally styled holiday house is composed of two old townhouses like a pyramid upside down. It's situated in the calm carless authentic medieval part of Old Antibes on historical Greek and Roman ground. The Picasso Museum in the Chateau Grimaldi and the impressing Roman Cathedral are neighbours. Les Volets Bleus is a house with character, the former owner a very well known Antibes furniture restaurator kept the century old wooden windows as he looked for handmade traditional material as the unique terracotta floor tiles or as he builded the handmade wooden kitchen or loft about 30 years ago. We see no need to replace these unique interior items by maybe more perfect functioning modern ones. That also makes that Les Volets Bleus as a whole unit are not a perfect modern flat, as we try to show also with our fotos. - the heating-/boiler (in 2013, as all radators have thermostat valves now) we use all usual kitchen technique water boiler, replaced the dishwasher in 2011 etc. We don't use microwaves! - in 2013 the sleepingroom on the first got a new parquet and a pure white painting instead of the beige former one, that makes the room brighter as before. - few years ago we replaced the sofas in the living by a big leather sofa that is compatible for bigger parties. Above all: The house is in a extreme central but despite that unique quiet position: The world-famous Picasso Museum is up this alley in less then 100 m. Here in the 'rue St. Esprit', the important French novelist Jacques Audiberti grew up, and the famous French song writer Claude Nougaro composed a song about him and this lane. There is a beautiful sandy 'house beach' at the feet of the property without direct access, but the way to it is one of the most alive ones in Antibes and maybe whole the côte. You can buy fresh fish from the fisher-men's harbour sales point on it, can get your newspapers and baguettes on the way back from your morning swim as one out of hundred suggestions. Naturally there are sailing facilities and motorboat rentals in the harbour or nearby beaches. SPECIAL OFFER:: Please contact the owner to discuss rental conditions for eventual long term (winter) periods - for more than two weeks - and in case different periods are desired. Parking situation: Usually - with very few exceptions - there are no parking's directly at the houses in the old town. Les Volets Bleus are in the privileged situation to have two of the very last toll free parkings for residents of the old town in only 30/60 meters distance on the Ramparts, but as there are too few, evidently there is no guarantee to get one at every time. As everything is so near, we use ourselves a car seldom. On request we can offer a parking card for a reserved area in the harbour for inhabitants of the old town reachable in a very nice walking distance by wonderful sightseeing ways. For renters who come by aeroplane: Our house management provides a pick-up and bring service from and to the airport. Besides the possibility to rent a car at the airport, it is also possible to get one easily occasionally in Antibes, there are several car rentals close to Les Volets Bleus. Public transport especially busses are cheap since some years and excellent related. studio on the ground floor mostly used as sleeping room with the facility of a kitchenette, TV Video ect. and separate toilet and shower, first floor: classical sleeping room on one level with a separate toilet and a complete bathroom and extra storage room with washing machine and other household tools and manier (children) beach toys, jeu de boules. several possibilities to prepare coffee, filtered, espresso, danish, etc. The spacious living is connected on one floor with the kitchen (uniting two former separated house parts) and so builds an important flat part on the second floor. It's open up to the roof and leads to a wide wooden loft with double bed & sofa that also can be used as another additional bed. The loft gives access to the wonderfully private terrace on this highest level of the house in direction south-east with possibility of panoramic sea view. The newly renovated famous Picasso Museum in the old Château Grimaldi building as the Sarazene tower of the cathedral completes the panorama in direct neighbour ship. 'La Gravette' is Vieil Antibes bay formed stonewall protected intimate sandy beach and it is the 'house beach' of LES VOLETS BLEUS as it lies at the feet of the quarter just a few steps outside the walls onto the remparts. Access via a very nice walk by entering the harbour. We had a wonderful stay in this typical, old, french house. It is always nice to stay at this very special place in Viel Antibes. The house is charming and invites to live like the people in the south of France. If you enjoy the view from the roof terrace you can see the sea. We will come again. This is my second time renting this property and I love its charm and location. I rented it with 4 other friends this month and we were very happy and comfortable here. The location is perfect for exploring Antibes and the area. Thanks Robert, Jo & Mark! we had a wonderful week in this nice old townhouse. Everything what we needed was there, the beach nearby and the supermarket an market! 5 minutes to go... the roof-deck was amazing, wheather was perfect. Thanks for sharing this place! Dieses Haus, seine Lage, seine Einrichtung ist ein Traum. Direkt in der Altstadt, nah zum Meer und dem Markt gelegen, kann man sich einfach keinen besseren Ort wünschen. Wir waren im Februar dort und so war es für uns auch wichtig, dass das Haus eine Heizung hat und innen sehr gemütlich ist. Alles war sauber, die Küche hat alles, was man zum Kochen braucht und auf der Dachterrasse konnten wir schon im Februar meist den ersten Kaffee am Morgen mit Blick aufs Meer und die Dächer der Altstadt trinken. Uns hat es besonders gefallen, dass das Haus nicht so steril und kühl eingerichtet ist, wie die meisten anderen Häuser/Wohnungen, die im Internet angeboten werden. Wir haben vier (Arbeits-)Wochen dort verbracht und uns vom ersten Tag an sehr wohl gefühlt. Die Kommunikation mit dem Vermieter war schnell und sehr gut. Die englischsprachigen Betreuer vor Ort ebenfalls. 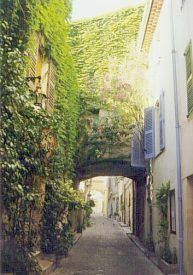 Das Haus liegt ruhig in einer malerischen Gasse von Antibes mitten in der historischen Altstadt. In 3 Minuten erreicht man zu Fuß den Stadtstrand, den Hafen mit Megayachten aber auch günstigem Motorbootverleih, den Marktplatz, die Stadtmauer und die Promenade mit vielen Bars und Restaurants. Das Haus ist sehr liebevoll und authentisch eingerichtet. Es hat uns an nichts gefehlt. Wir haben uns von einer nahe gelegenen Boulangerie Croissants und Baguettes geholt und auf der sonnigen Dachterrasse gefrühstückt. Von hier aus hat man einen tollen Blick über die Dächer Antibes und auf das Meer. Die Terrasse ist ebenfalls für lauschige Rotweinabende zu empfehlen. Die umgebenen Orte Nizza, Cannes und Monaco sind mit dem Auto aber auch mit dem Zug schnell zu erreichen. Die Besitzer waren sehr zuvorkommend und haben uns noch ein paar Insidertipps gegeben. We had a wonderful professional stay at Les Volets Bleus (only 200m from our stand at the Antibes Yacht Show 2011!). The accommodation was spotlessly clean. The house is perfectly well equipped. The house is next to everything incl. supermarkets, the bars and restaurants of Antibes. There is an excellent restaurant just in front of the house in the same street! The beach is at 50m from the house. We have no hesitation in recommending this house to others. Enjoy! This property is situated in the true historical part just a few steps from the sea, 'Plage Gravette' our house beach that makes a pool unneccessary is nestled at he feet of the quarter, some of the most familiar sandy beach places at whole Cote d'azur. At Antibes harbour next to it you'll find yachts only seen in films or television before, the Picasso museum -former Grimaldi castle- is near just like a neighbour, the Marchée Provencale also at no distance to get fresh food every day around the corner, plenty of restaurants to approve every day another one, none that can be called bad. The house is situated in a quiet pedestrian area, no car needed - carrentals nearby - parkingspace with a special resident card in the nearby harbour can be provided on request. The house has on the loft level above the kitchen and living area a very nice terra cotta tiled terrace which is framed by blossoming climbing plants all around, protected against wind and -view already with partly sea view. NEW: Since 2012 we added a four steps higher new platform with terrific panoramic sea view above the houses in the first row at the waterfront as we widened the older part with a U-form sittingplace with a big table that permits to dine with up to eight on the terrace. Extra: 28 Euros for linen, energies, water etc. per person and week, final cleaning included. The upper part of the house offers all facilities for up to 6, the complete house for a maximum up to 8 persons. The studio apartment on the ground floor has an optional separate entrance but is normally connceted to the rest of the house, it has thus it's own kitchenette and is also fully equipped with television, DVD and CDradio.